The USTA Midwest Section has awarded Shannon Etten, Appleton, the prestigious Sportsmanship Award at the Midwest Designated G14. The tournament was held in Homewood, Illinois, January 24-26, 2009. This esteemed award is voted by peers, officials and tournament staff. The Sportsmanship Award recognizes conduct and attitude considered befitting participants in sports, with particular attention to fair play, courtesy, striving spirit and grace in losing. Shannon exhibited the highest level of character, etiquette and responsibility in meriting this award. The USTA Midwest Section is addressing and encouraging sportsmanship with a 2009 initiative and sportsmanship guidebook, “Character Taught with Every Line Call”. Its mission is to educate players, parents and coaches about sportsmanship issues through guidance and education. 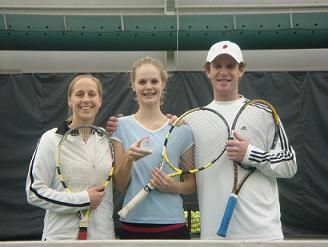 The guidebook can be found on the Wisconsin Tennis Association web site at www.wisconsin.usta.com. The Wisconsin Tennis Association applauds and congratulates Shannon for her exemplary conduct, service as a role model and supreme integrity.